One of the great truisms of life says that you can’t be all things to all people. And most of the time that seems to hold true. In fact, usually, when someone tries to be more than one thing—to be “two-faced,” as it were—they end up doing a terrible job at both. For example, have you ever visited one of those buffet-style restaurants that advertises steak and pasta and lobster and sushi and Chinese food and brunch for a price that ends in .99? It might sound like you’re going to get a lot of great food for a low price, but the truth is that none of those foods are likely to be optimally prepared. You might even be lucky to leave without food poisoning. Or imagine a car that tried to be both a minivan and a great sports car. This kind of mash-up is most likely to result in a mess that doesn’t appeal to either van buyers or motorheads (or anyone else). B2B pricing is one area where being two-faced actually works out. In fact, it doesn’t just work out, it is the absolute best option available. When you have a great segmentation model, you can offer a super-low price to your price-sensitive buyers. And you can offer a slightly higher price to customers who are more interested in value. And for those customers who really want what you have and are willing to pay—you can give them an even higher price. But in order to succeed with this sort of “two-faced” pricing, you absolutely have to have a great segmentation model. And having the right technology to help you out with your segmentation doesn’t hurt either. 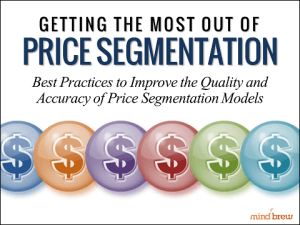 If you don’t currently have a segmentation model (or the one you have isn’t working all that well), The Fundamentals of Price Segmentation is a great place to start. It explains the key principles and concepts and then walks you through the process of creating a model from scratch, step by step. Once you have a model in place, it’s time to start making it better. Getting the Most Out of Price Segmentation offers improvement tips as well as highlighting some common missteps to avoid. It can help you iterate to make incremental improvements in your model over time. Of course, your segmentation model is just one part of the puzzle—albeit a very big and important piece of the puzzle. To maximize your profits, you also need to offer each of your segments the ideal price for them. For that, you need to measure price elasticity. The webinar All About Price Optimization explains how price elasticity applies to B2B and how to make it work for you. In this expert interview, Mark Burton of Holden Advisors shares his latest insights and advice for getting beyond tactical analysis and taking your pricing department to the next level.